Mary Beard explores the growth of hair colouring with a consultation at a leading salon and reflections on ageism as the new 'glass ceiling'. Professor Mary Beard is a distinguished Cambridge Classical scholar with a string of highly-regarded books on Ancient Rome to her name, so it's slightly irksome to her that she is almost better known for her long grey hair. 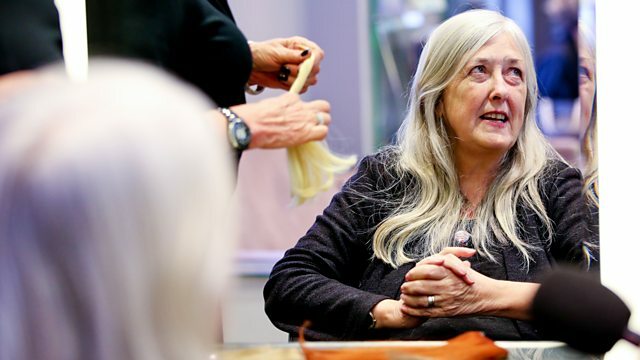 In this highly-authored Radio Four documentary, Mary Beard investigates a growing reluctance to embrace grey hair. Starting in the Mayfair salon of "hair colourist to the stars", Jo Hansford, she's informed that her hair is "dreadful" and given a personal consultation by Jo herself about how and why she should colour it. In favour of choice and the fun of colouring hair, (she has always hankered after pink streaks), Mary is particularly disturbed by the pressures in society for women to conceal their age. It's not just about women, though. Mary has recently come to recognise that far more men now colour their hair, but why won't any of them talk to her about it? Eventually, fellow Cambridge Classicist, Professor Simon Goldhill, agrees to "come out" on air. In defending his use of colour and challenging Mary's own choice, he gives her a philosophical run for her money. Ultimately, Mary has to admit the paradox of making a radio programme about grey hair, so she turns to a surprise, high-profile television presenter to learn more about the pressures on women in the public sphere to colour their hair. Concluding that ageism may be the new "glass ceiling", Mary insists upon the right to be both an "enfant terrible" and also an "eminence grise". The all-grey production team consists of production coordinator Anne Smith and producer Beaty Rubens. Mary Beard on the experience of visiting a hair colourist. Simon Goldhill, Professor at Kings College, Cambridge agreed to `come out' on air about colouring his hair to Mary. Mary with Joan Burstein co-founder of Browns fashion boutique and her daughter Caroline co-founder of Molton Browns toiletries.